Turn to Section 2 of your answer sheet to answer the questions in this section. Questions 1–11 are based on the following passage and supplementary material. Who Really Owns American Media? In this era of blogging, news websites, and personalized Twitter feeds, most of us believe that we have more choice than ever 1 in how we get our news. But unless you’re particularly 2 apt about the world of journalism, you might be surprised to learn how few choices we really have. Thirty years ago, 50 different corporations owned 90% of the American broadcast and news media. Today, just 6 large conglomerates 3 have the same control over that media, which is still 90%. These huge corporations have successfully lobbied the U.S. Congress to loosen or dismantle federal antitrust regulations. These regulations were designed to prevent any one corporation from driving out 4 their competition and controlling public discourse. The debate on this issue centers on the balance between liberties and governmental interference. Some argue that a corporation’s freedom to acquire media and voice its opinion trumps any right the public may have to diverse points of view. 5 The other argument would be that our constitutional freedom of the press requires regulation in order to maintain a free market of ideas and an informed citizenry. 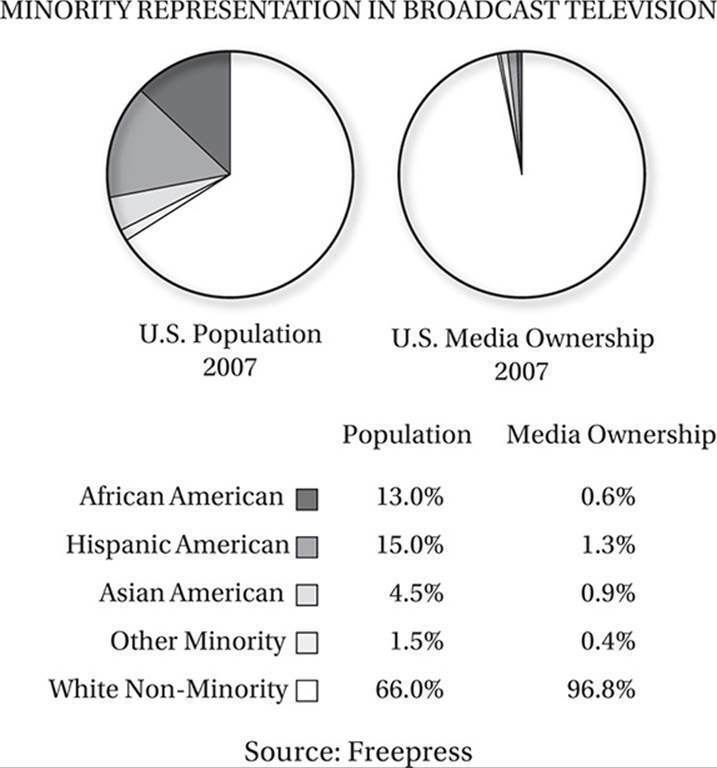 According to data from 2007, the American media does not quite look like America. Although fully 33% of the American population was minority, 6 only 3.2% of American broadcast television outlets were controlled by minorities. One potent antidote 7 regarding media consolidation is the Internet. 8 With some research, it reveals many resources for the curious and intelligent media consumer to hear informed voices from a wide variety of perspectives. Which of the following best represents the information from Figure 1? 9 Although the Web abounds with gossip, partisanship, and fear-mongering from many major outlets, and conspiracy theorists on the fringe, the careful viewer can also find thoughtful analysis and civilized debate of the issues. Sites like ProPublica, FactCheck.org, and NPR provide in-depth, nonprofit, public-supported journalism that is less influenced by any corporate or political agenda. 10 Therefore, sensationalism sells, and the media conglomerates have mastered the art. As the first great American media mogul, William Randolph Hearst, said, “If you want the public in sufficient numbers, construct a highway. Advertising is that highway.” Without large advertising and lobbying budgets, these nonpartisan 11 instances of journalism will have a difficult time competing with the big boys. The author wants to introduce this sentence with a representation of modern media that contrasts with the ideal of “civilized debate.” Does this introduction accomplish this task? A) Yes, because it suggests that controversial matters are ignored in modern media. B) Yes, because it refers to relatively unsophisticated modes of conversation. C) No, because it focuses on entertainment rather than any examination of issues. D) No, because it refers to hypothetical situations rather than real ones. Questions 12–22 are based on the following passage. Have you ever knocked on wood to dodge a jinx? Do you avoid stepping on cracks in the sidewalk? Do you feel uneasy about the number 13? Most of us realize that these 12 rituals, which are based on ancient and discredited beliefs, but we can’t so easily rid our minds of superstitious thinking. Every culture has its own superstitious beliefs, 13 and now anthropologists and psychologists are beginning to understand why. Our brains constantly work to find cause-and-effect patterns in the world. When something strange happens that we can’t explain, or seems to 14 collid against what we already believe, we get an uncomfortable feeling known as “cognitive dissonance.” We reflexively fill this gap in knowledge with the explanations that are most easily available to us. 15 Since we are willful beings surrounded by other willful beings, and every conscious moment of our lives is filled with a sense of “agency,” 16 that is: intentional action. Therefore, we imagine tiny beings living in wood, or vaporous spirits roaming the clouds that do strange or harmful things when we displease them. Willful agency is our “default” explanation. The author is considering adding the following sentence to this paragraph. Others are sad and bizarre, such as the belief in shape-shifting. Although superstitious explanations relieve our cognitive dissonance, 19 it might also lead to tragedy. In 2014, people in Paraguay and Tanzania were killed because locals accused them of witchcraft. 20 Some superstitious parents have even beaten or disowned their own children because their strange behavior is attributed to demonic possession. Superstitions are also not harmless when they impede the pursuit of science, placing obstacles in the way of medical and technological breakthroughs that can improve the human condition. B) Some superstitious parents, believing that any strange behavior is a sign of demonic possession, have even beaten or disowned their own children. C) Even beating or disowning their own children, many superstitious parents attribute their strange behavior to demonic possession. D) Some superstitious parents, believing that their strange behavior is a sign of demonic possession, have even beaten or disowned their own children. Which concluding sentence would be most in keeping with the content and tone of the passage as a whole? A) However, feeling like we have control over a situation is not always the same as understanding it. B) They represent some of humanity’s greatest accomplishments, and have inspired some of our greatest works of art. C) Centuries from now, our rituals may become so elaborate that we would scarcely recognize them as such today. D) Without such rituals, we would not feel as connected to the people or the natural world around us. Questions 23–33 are based on the following passage. Even scientists sometimes forget how essential skepticism, particularly self-skepticism, is to the scientific process. But scientific skepticism is driven by evidence, not agenda. Today, the field of climatology seems to have more than its share of skeptics, debating 23 a warming planet and the things that should be done by us about it, if anything. 24 They are coming from outside of the scientific community, many of these skeptics couch their arguments in political terms. Some claim that global warming is part of a partisan “left-wing” plot or a ploy by the scientific community to ensure funding for yet another “Chicken Little” scare. Others suggest that attempts to reduce greenhouse gas emissions by changing energy or land use policies 25 would provide a needless cost of the American taxpayer of tens to hundreds of billions of dollars annually. Some even suggest that they are really part of an international conspiracy to undermine America’s competitiveness in the global marketplace. At the same time, others who legitimately question the data or theories related to climate change are too quickly labeled right-wing “deniers,” even if their concerns are not motivated by any partisan convictions. In fact, science has, or should have, nothing to do with ideology. Rather, it 26 is a process of identifying significant natural phenomena, gathering evidence about those phenomena, and 27 then we must find the most reliable explanation for that evidence. The preponderance of the evidence suggests that the earth is getting warmer, that the effects of that warming will be problematic, that there are things we can do to prevent or at least mitigate the worst outcomes, and 28 perhaps that many of these things are well worth doing. There is still plenty of uncertainty about the complex systems that make up our planetary climate, but we know enough to be concerned, 29 and to discuss the issue without politicizing it. In the context of the passage as a whole, which of the following completes the sentence most appropriately? The author is considering inserting the following sentence into this paragraph. Furthermore, we become more adept at evaluating the facts and theories at the heart of the matter. Questions 34–44 are based on the following passage. Bohemia is a landlocked country in central 34 Europe, and until 1918 they were ruled from Vienna by the Austrian Hapsburgs. Today it 35 regards a major part of the modern Czech Republic, and its largest city, Prague, serves as the nation’s capital. Bohemia is also another, less clearly defined country, a country of the mind. This Bohemia in fact derives from misconceptions about the true Bohemia that go back as far as Shakespeare, 36 designating Bohemia as the land of gypsies and the spiritual habitation of artists. By 1843, when Michael William Balfe’s opera The Bohemian Girl premiered in London, the term Bohemian 37 would come to mean any wandering or vagabond soul, who need not have been associated with the arts. The Parisian poet Henry Murger clinched the term’s special association with the life of artists. In November 1849, a dramatized version of Murger’s Latin Quarter tales was staged in Paris with the title La Vie de Bohème. So extraordinarily successful 38 did this prove that the stories themselves were published as Scènes de la Vie de Bohème. The public’s appetite was whetted and a popular cult of the gypsy-artist was underway. Murger’s volume of stories became the textbook for the artistic life throughout the late nineteenth and early twentieth centuries. 39 What was it that were the basic elements of this Bohemia as it evolved under Murger? To start with, Bohemia belonged to the romantic movements that preached the power of the individual imagination and came to adopt a secular religion of art. Like early Christianity, it had its true believers and its heathens. The believers in this case were the artists themselves, the elect of the spirit, touched with the divine power of imagination, while the heathen were the commercial middle classes who had 40 propagated as a result of increased commodity production in the wake of the Industrial Revolution. The author is considering including the following sentence in this paragraph. Murger can thus be described as a Bohemian of the second generation.